Who knew that the simple combination of eggs and fillings in a tortilla would be so addicting? Austinites are serious about their breakfast tacos, and you’ll find everything from the basics, to a full breakfast in a roll on nearly every corner in the city. The breakfast taco is a prime example of Austin’s Tex-Mex cuisine. The dish was created by Mexican immigrant families in the Rio Grande Valley and was picked up somewhere down the line by Austin’s foodie scene, where its popularity boomed and doesn’t seem to be dying down anytime soon. While it’s popular in many Texas cities—and each will try to lay claim to the title of Birthplace of the Breakfast Taco—you can’t argue that when it comes to this particular dish, Austin knows its stuff. Of course, these are only a few of the many places to grab this breakfast-on-the-go in Austin. If you’re feeling adventurous, stop by any of the little food trailers scattered throughout the city—most have their own authentic breakfast taco, made on homemade tortillas with family recipes. Austinites love staying local, and Taco Deli’s commitment to fresh, local ingredients is just the icing on the cake—or should we say, the salsa on the taco?—at this award-winning taco joint. You are welcome to build your own perfect breakfast taco, or choose from one of their house specialties like the Migas Taco, or The Vaquero (eggs, grilled corn, roasted peppers, jack cheese). They even have a vegan option. Get breakfast all day at this popular Cesar Chavez spot. While they’re known for the Don Juan Challenge (featured on Man Vs. Food), all of their breakfast tacos are truly where this family-run business shines. No frills, just simple, delicious tacos. If you don’t have the stomach room for the Don Juan, try a bacon and egg or a chorizo and potato taco, and pair it with homemade horchata. You can’t get much more authentic than this food trailer’s cuisine—the sisters who started the business grew up in Veracruz, Mexico. The sisters have a passion for fresh, local ingredients and have a small but tasty menu. Customers can build their own breakfast tacos, or try the La Reyna, a healthy option with egg whites, veggies, and cheese. One of Austin’s many food-trailer-to-brick-and-mortar success stories, Torchy’s started in a food trailer park and now boasts 30 locations in Texas and Colorado that serve unique takes on the popular dish. Try the Ranch Hand (a breakfast taco with beef fajita) or the Wrangler (a unique take on the popular potato taco, souped up with brisket) and be sure to get a side of their delicious street corn. Taco Flats originally opened in the 1970s as an eatery and entertainment space, only to close in 1980. A local business owner revived the concept and opened the new restaurant on Burnet Road, keeping the vibe of the original while putting a stronger focus on the food. Try the Huevo Ranchero (refried black beans, jack cheese, fried egg, salsa ranchero, cilantro) or the Dirty South (refried black beans, potato, bacon, scrambled eggs, American cheese). 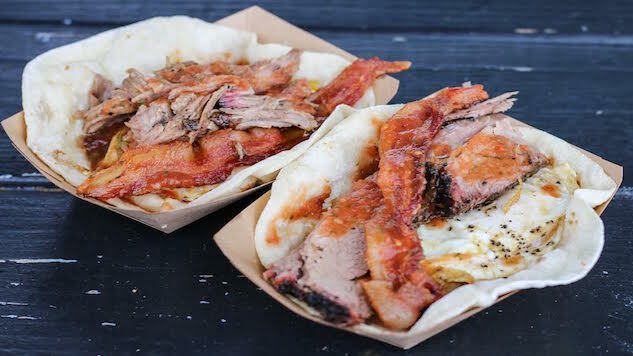 You’ll find some of the best BBQ in town at food trailers like Valentina’s, and their breakfast menu takes their delicious brisket and pulled pork and puts it alongside eggs and cheese in homemade tortillas. Be sure to put in an order before 11am for The Real Deal Holyfield, a taco stuffed with serrano salsa, fried egg, potatoes, refried beans, bacon and pulled pork or brisket. Austinites are still grieving the loss of the original Tamale House on Airport Blvd, which closed in 2014 after the death of the owner. The spirit lives on at the Tamale House East location, which is run by family members of the original. The thriving restaurant has the usual breakfast tacos on your choice of flour, corn, or wheat tortilla. Enjoy the patio area with a cold margarita and a potato and egg taco.